Yes, here I am on a Friday actually posting about a recipe that was scheduled for today. I amaze even myself sometimes. When I saw that this gnocchi a la parisienne was the assigned dish, it seemed too good to postpone. 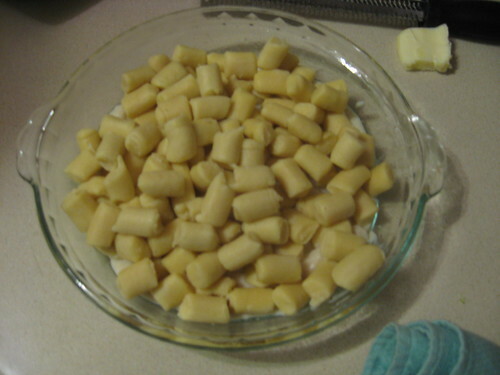 As soon as I saw "gnocchi" in the title of this recipe I got excited because I love those little potato pillows. When I saw that these were made from choux pastry (which is also the base for cream puffs and gougeres), my interest was piqued. Plus, how could dumplings blanketed in cheese and a creamy sauce possibly be bad? This dish, though a bit time consuming, is actually not difficult to put together. 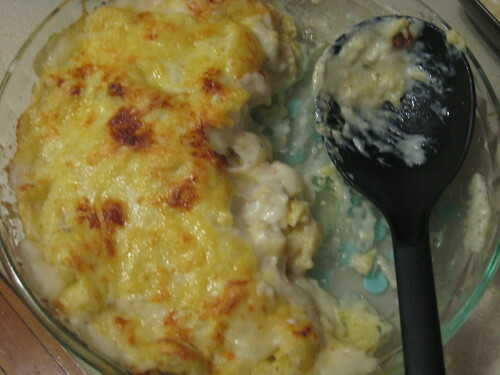 The bechamel and gnocchi can both be made ahead of time then assembled before dinner (Dorie does warn that this is a dish that should be eaten immediately). When it came time to poach the gnocchi, I started by using a teaspoon measure to dish out the dough. Because I am a perfectionist (and, lets be honest, a bit lazy), I decided to pipe the dough instead. 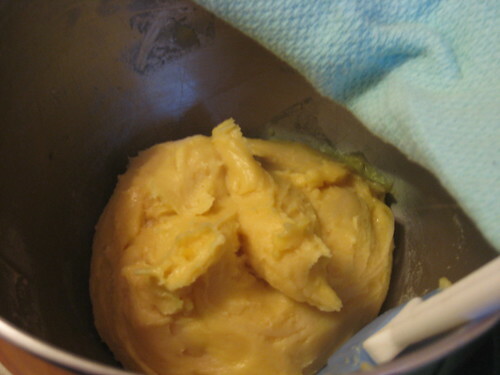 I popped it into a zipper bag and cut off the corner, then squeezed out the dough until it was about an inch long before cutting it off with a paring knife. This was much less time consuming, and I was left with more uniform dumplings. Otherwise I followed the recipe, except that I used skim milk because I forgot to buy a quart of whole. Despite the fat free milk, the dish was still plenty rich. In fact, I would say that the richness was almost too intense. The dumplings are buttery, the sauce is creamy, and the cheese, while providing a nice crust, was also very rich. I served this with some stalks of roasted broccoli, but it still felt very heavy. For me, this needed something to break up the richness; I think spinach would be very good, also roasted peppers or even some darkly sauteed mushrooms . I think that some bacon or maybe some crumbled spicy sausage would also make a nice addition and add some complexity. Despite these "complaints," Andrew and I still managed to eat an alarming amount of this dish. Of course, when it is 15 degrees outside it is not very difficult to rationalize an (extra)large portion of such a warm and comforting dish. For this recipe (and many more fantastic French dishes), pick up a copy of Around My French Table. 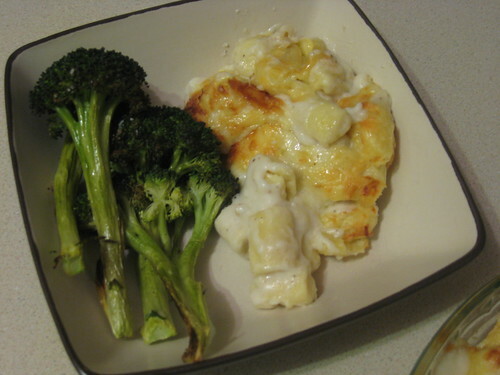 To see how everyone else liked this baked gnocchi dish, head to the French Fridays with Dorie site. I think if I were to make them again, I'd pipe them out. I didn't mind the blob versions I got with teaspoons, though, especially as they were covered in sauce and cheese.